RSM's Golf Blog: Hello 2018! We hope you had a wonderful holiday season and that you were able to spend some quality time with friends and family. The East Coast is greeting 2018 with a winter storm, so we hope all those being impacted stay warm and safe! With the start of each year comes new resolutions. If any of yours were golf-related, PGA.com shared five tips to help you keep those resolutions in 2018. Take a look at some of the tips and tricks. 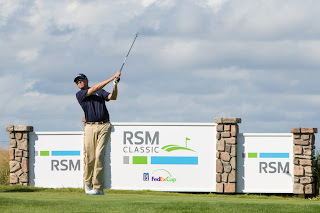 It’s a relatively quiet week for Team RSM, although Kevin Kisner, 2015 RSM Classic winner and Austin Cook, 2017 RSM Classic winner, is playing this week in the Sentry Tournament of Champions at Kapalua Resort in beautiful Hawaii. You can follow along here. And as we begin the new calendar year, we thought we’d take a walk down memory lane. During the 2017 RSM Classic tournament week, we did a quick Q&A with multiple PGA TOUR players. Check out some of the interviews to get a little more insight on these players. We’re looking forward to seeing what 2018 has in store for Team RSM and The RSM Classic (scheduled for Nov. 12-18 this year). Be sure to stop by next week for our next update.